Title [Garland (Jack) Stahl and A. E. Olson, in a bank located at 730 E. 63rd Street] [graphic]. Dates ca. 1916 Mar. 6. 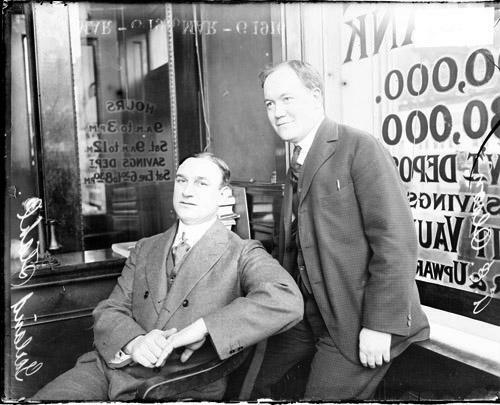 Collection summary Group portrait of Garland (Jack) Stahl, president of Washington Park National Bank, sitting in the bank, with A. E. Olson standing behind him, leaning against the windowsill of the bank's painted window. The bank was located at 730 East 63rd Street in the Woodlawn community area of Chicago, Illinois.